Outstanding chaser Denman could warm up for this year’s totesport Cheltenham Gold Cup in the £100,000 Grade Two Argento Chase (2.35pm). The Paul Nicholls-trained 10-year-old is among 11 entries for the three-mile, one and a half furlong, contest, the feature race of Festival Trials Day at Cheltenham on Saturday, January 30. 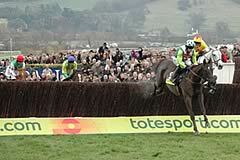 Denman boats an exceptional record at Cheltenham, with his four victories at the course including a terrific seven-length victory over Kauto Star in the 2008 totesport Cheltenham Gold Cup as well as a galloping success in the RSA Chase at the previous year’s Festival. A heart condition interrupted his preparation for chasing’s blue riband last year, but he still took second behind stable companion and long-time rival Kauto Star. The Presenting gelding has returned to his brilliant best this term, storming to victory under top-weight in the Hennessy Gold Cup on his seasonal return at Newbury in November. Barbers Shop was fourth behind Denman on that occasion and the Nicky Henderson-trained chaser, who is owned by The Queen, may also bid to book his place at this year’s Festival with a good run in either the Argento Chase or the £50,000 Grade Three Betfair Trophy Chase (2.05pm), which has received an entry of 23. The eight-year-old, who is on course for a tilt at the Ryanair Chase at The Festival, took seventh behind Kauto Star in last season’s totesport Cheltenham Gold and produced a career-best effort to be third behind the same horse in the King George VI Chase at Kempton Park on Boxing Day. Sir Michael Oswald, racing manager for The Queen's Jump horses, commented: “We have given Barbers Shop two entries at Cheltenham but a lot will depend on the ground - he was taken out of Ascot on Saturday because it was very soft. I think that Nicky would like to get a run into him before the Ryanair Chase but the ground has to be right. “He would have to give a lot of weight away if he lined up in the Betfair Handicap Chase but it is run over the same distance as the Ryanair Chase, whereas the trip of the Argento Chase might be a bit too far for him at the moment. It will be Nicky’s call which race he might line up in, but I think the ground will be the crucial factor. “Two miles and five furlongs around Cheltenham is more or less three miles at most other courses and he seemed to get a bit tired in the Hennessy Gold Cup and the King George VI Chase. They went a very good gallop in both those races and he was taking on Denman and Kauto Star, which is like taking on a pair of steam engines. Apart from Denman, champion trainer Paul Nicholls may also be represented by the 2007 Ryanair Chase victor Taranis and Inchidaly Rock, who easily landed the Ryman The Stationer Novices’ Chase at Cheltenham’s Boylesports International on December 12. A trio from the stable of Nigel Twiston-Davies consists of the 2008 winner Knowhere, Grade One scorer Ollie Magern and Beat The Boys, while David Pipe has entered Madison Du Berlais, who lowered the colours of Denman in Grade Two chases at Kempton and Aintree last season. Carruthers was fourth in last year’s RSA Chase and the seven-year-old, who is owned by Lord Oaksey and is trained by his son-in-law Mark Bradstock, comfortably took a graduation chase at Newbury in December. The Nicky Richards-trained Money Trix went down by half a length in the Grade One Lexus Chase at Leopardstown’s Christmas meeting, while Cheltenham specialist Joe Lively recorded a game success in last year’s Argento Chase for trainer Colin Tizzard. Saturday’s card, which is the last day’s racing prior to The Festival, also features the £50,000 Grade Two Betfair Cleeve Hurdle (3.40pm), a leading trial for the Ladbrokes World Hurdle. The three-mile contest has attracted an entry of 15, headed by the Alan King-trained Karabak, who was runner-up to Mikael D’Haguenet at last year’s Festival and chased home Big Buck’s in the Grade Two Long Walk at Newbury on his latest appearance. Roxburghshire-based handler Willie Amos may send down the progressive Lie Forrit, who landed the Listed Jardine Lloyd Thompson Handicap Hurdle at The Open before going on to victory in a Newbury Pertemps qualifier. The 2008 Smurfit Kappa Champion Hurdle winner Katchit could also bid to enhance his claims for the Ladbrokes World Hurdle, while Time For Rupert, Mr Thriller and Fair Along may also try and further their Festival aspirations. Another fascinating contender is the Howard Johnson-trained Tidal Bay. The 2008 Irish Independent Arkle Challenge Trophy Chase may make his first appearance over the smaller obstacles since taking a Grade Two hurdle at Aintree’s Grand National meeting in 2007. The £27,000 Grade Two Betfair Finesse Juvenile Novices’ Hurdle (12.55pm) is set to provide some key pointers for the Grade One JCB Triumph Hurdle and an entry of 13 includes leading Festival fancy Pistolet Noir, who is set to make his debut for Paul Nicholls having comprehensively won the Grade Two Prestbury Juvenile Novices' Hurdle at The Open for former handler Nick Williams. Further Grade Two action is provided by the £27,000 Grade Two Neptune Investment Management Novices’ Hurdle (3.10pm), for which 18 horses have been entered headed by the Nicky Henderson-trained pair of General Miller and Master Of The Hall. The Paul Nicholls-trained Royal Charm has notched two impressive victories at Exeter, while Restless Harry was headed close home when coming second in the Grade One Challow Novices’ Hurdle for trainer Robin Dickin at Newbury on his latest start. A seven-race card also features the £22,500 Timeform Novices’ Handicap Chase (1.30pm), for which 28 horses have been entered, and concludes with the £18,000 Stellar Football Handicap Hurdle (4.20pm, 31 entries). After racing on Festival Trials Day, the Brightwells Cheltenham January Sale will take place, commencing at 5.30pm in The Centaur. The going at Cheltenham is currently Soft, Heavy in Places. The weather is forecast to be mostly dry throughout the week, turning colder towards the weekend. The inaugural running of the Argento Chase took place in 1980, when the Nicky Henderson-trained Raffi Nelson prevailed under jockey Steve Smith Eccles. The two most successful trainers are David Elsworth, who recorded two victories courtesy of Lesley Ann in 1982 and Combs Ditch the following season and Paul Nicholls, who struck with See More Business in 1998 and again three years later. Elsworth would have made it three in 1988, but his “winner” Cavvies Clown was subsequently disqualified after failing a dope test. 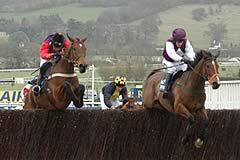 Rince Ri became the first and to date only Irish-trained winner in the history of the Argento Chase when he scored for Ted Walsh under a fine ride from his son Ruby in 2002, while in 2004 Jair Du Cochet was the first French-trained winner. Steve Smith Eccles is the most successful rider in the Argento Chase, having won on Raffi Nelson in 1980, Misty Spirit six seasons later and Sibton Abbey in 1993. Colin Brown, Richard Dunwoody, Norman Williamson and Tony McCoy have all taken this illustrious event twice. Brown won on Lesley Ann in 1982 and Combs Ditch the following season, Richard Dunwoody secured a place on the roll of honour courtesy of West Tip in 1985 and One Man in 1997, Williamson won on Master Oats in 1995 and Looks Like Trouble in 2000, while McCoy, the only current jockey to have been successful more than once, scored on Cyfor Malta in 1999 and Exotic Dancer in 2007. 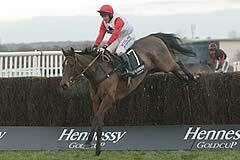 Four Argento Chase winners have subsequently gone on to glory in the totesport Cheltenham Gold Cup. The Peter Easterby-trained Little Owl won the Argento Chase in 1981 before taking chasing’s Blue Riband in the same year. Master Oats achieved the same feat for trainer Kim Bailey in 1995. See More Business, successful in the 1998 Argento Chase and then again in 2001, captured the Gold Cup in 1999, while Looks Like Trouble achieved this brilliant double in 2000. The only amateur rider to have scored in the Argento Chase was Jim Wilson, who partnered Little Owl in 1981. Their greatest moment came with victory in the 1981 totesport Cheltenham Gold Cup. Favourites have gained success in just seven of the 27 runnings of the Argento Chase, demonstrating what a competitive race it is. The most recent market leader to prevail was the Martin Pipe-trained Cyfor Malta in 1999. See You Sometime (2006), Grey Abbey (2005) and See More Business (2001) are the three oldest winners of the Argento Chase - all were aged 11. At the other end of the spectrum, six-year-old Cyfor Malta was the youngest horse to score. A breakdown of the winners by age gives six-year-olds - 1; seven-year-olds - 7; eight-year-olds - 9; nine-year-olds - 5; 10-year-olds - 2; 11-year-olds - 3.